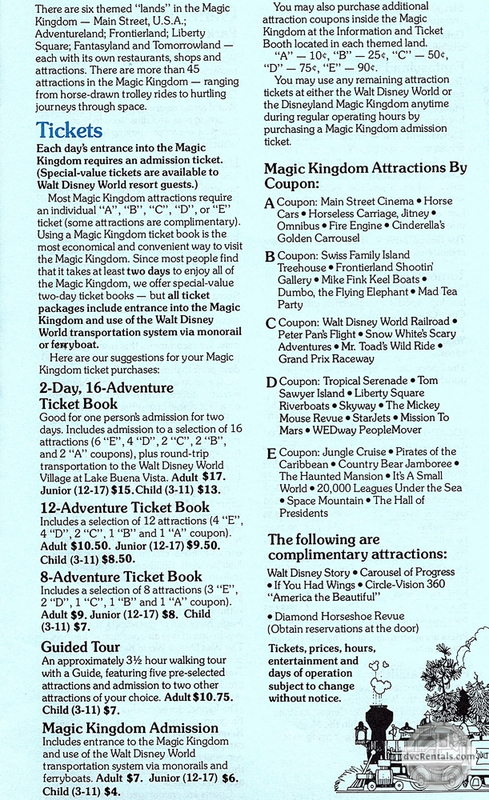 As most visitors to Walt Disney World know, things change there all the time. While there are some attractions that still exist from when the resort first opened on October 1, 1971, even those original attractions have gone through changes over the years. This blog is going to concentrate on changes that occurred ten years ago or more. Everything I’m writing about either no longer exists or has undergone dramatic changes. I did not include any recent changes, only things that are ten years or older. If you are young enough you probably never experienced many of these things, and hopefully you’ll find it interesting or learn something new. If you’re old enough it should be a blast from the past. Everything in this blog is from my personal collection of pics and memorabilia with a couple of exceptions. 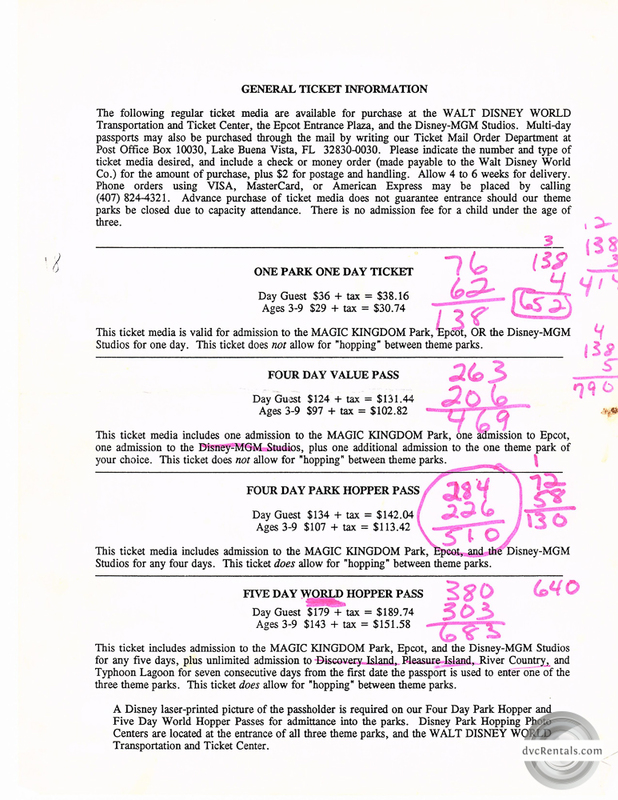 A few things, such as the price charts, were copied from handouts that I saved and which were originally provided by Disney when I visited at that time. 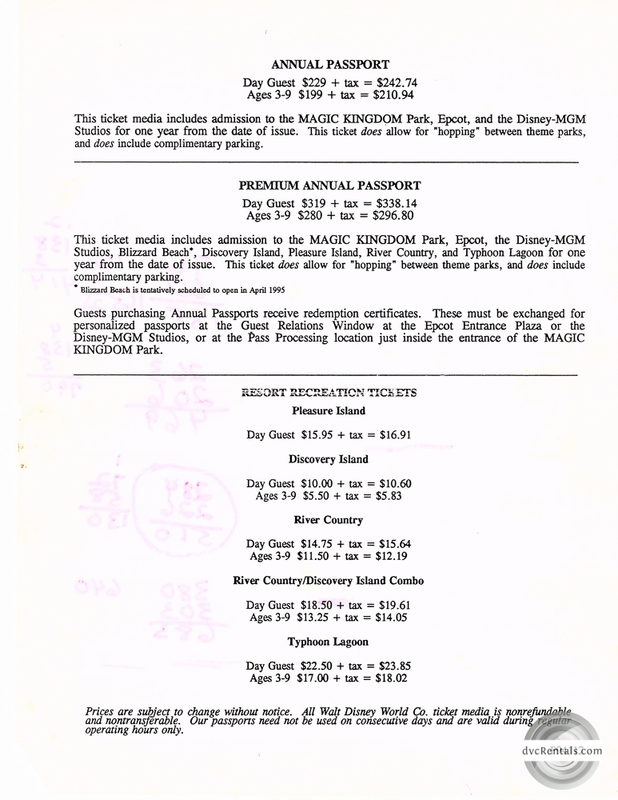 First, the ticket prices sure have changed. I have included pics of the costs from 1979 and 1993. It will amaze you when you see how cheap it used to be way back when. Of course minimum wage has gone up considerably since then too, but it still blows my mind to look at those price charts. Same for resorts, big changes in costs through the years. 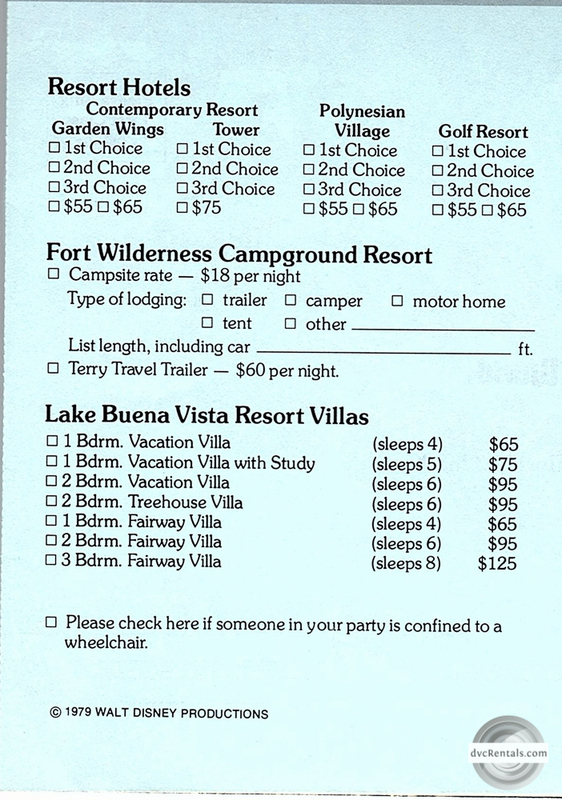 I have included pictures with prices from 1979 and 2000. 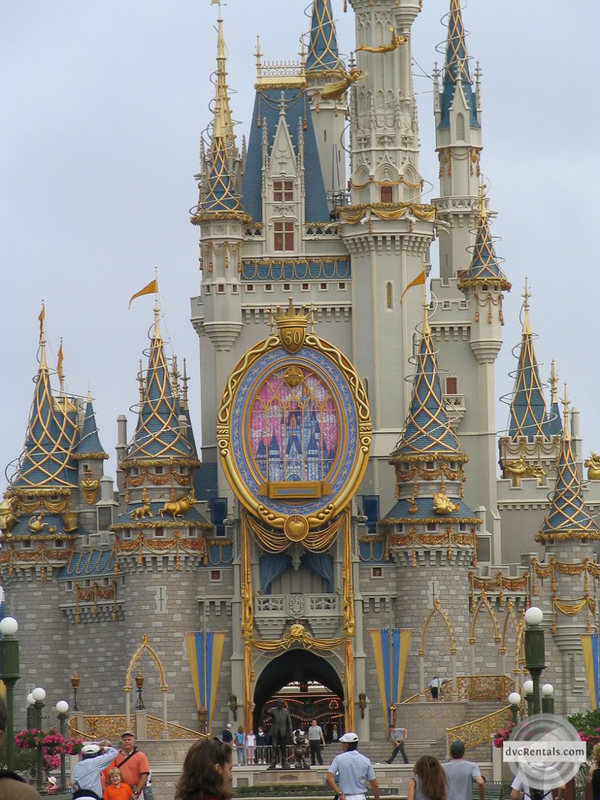 The Cinderella Castle has also undergone many changes throughout the years. 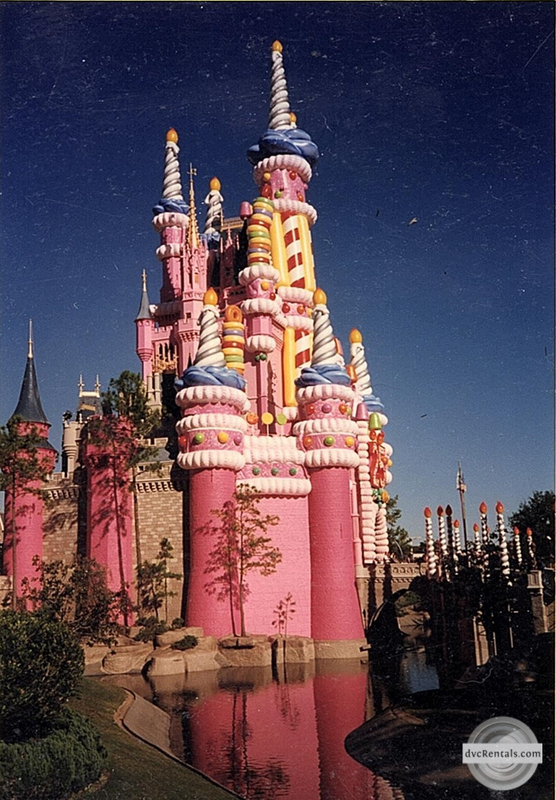 Some of you remember (and not everyone remembers this fondly) the pink birthday cake Castle from 1996 to 1998, erected to celebrate Walt Disney World’s 25th anniversary. You can also see pictures of the castle 10 years later, in 2006. 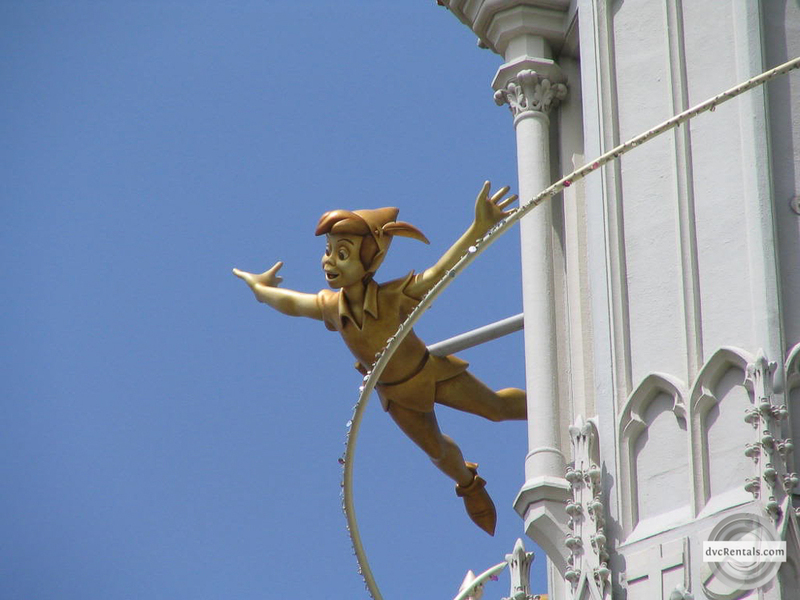 At that time they had added beautiful gold figurines to the exterior to mark Disney’s 35th anniversary. 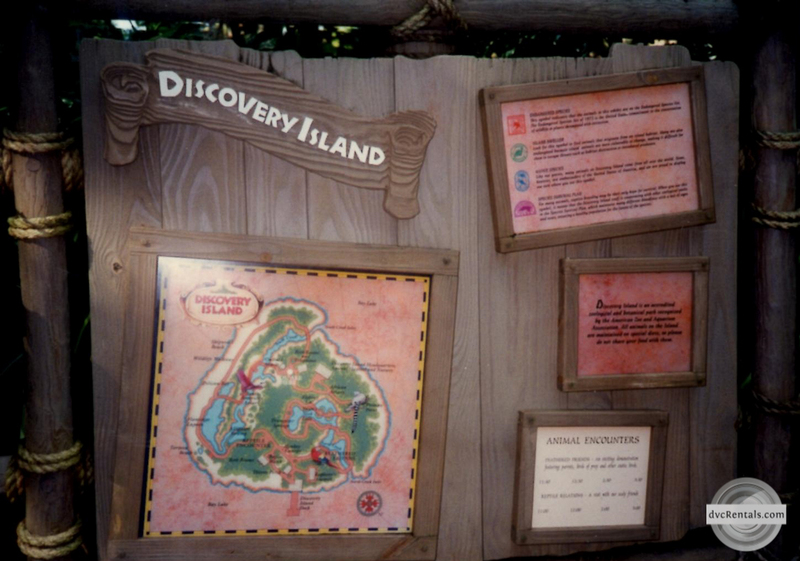 How many people remember Discovery Island? 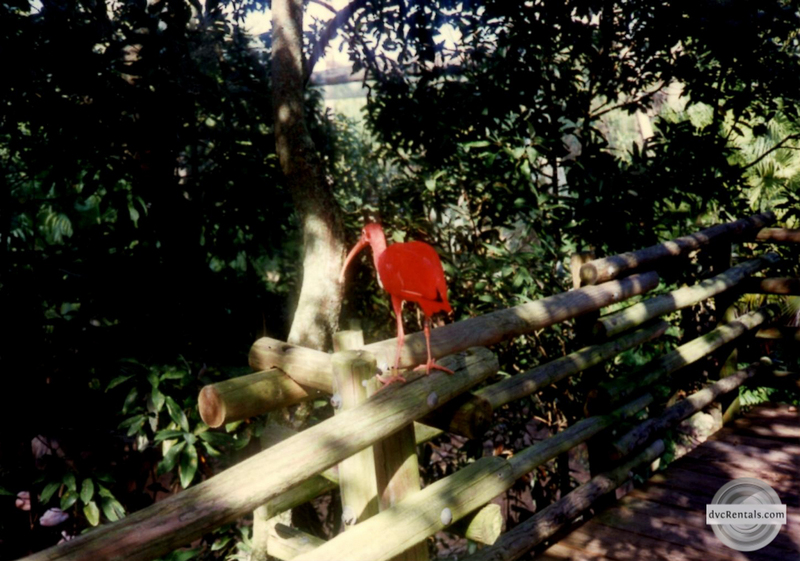 Before Animal Kingdom this was the only place on property to see and learn about live animals. There were mostly birds and reptiles and there were no large animals like giraffes or lions. But the walk around the Island was lovely and there were many interesting and informative shows/talks done by Cast Members who worked there. I remember one show during which the Cast Member put a tarantula on the back of a boy who was about ten years old. He expected the boy to freak out, but surprisingly the child was very cool about it. A lot cooler than I would have been! Now on to a couple of attractions. 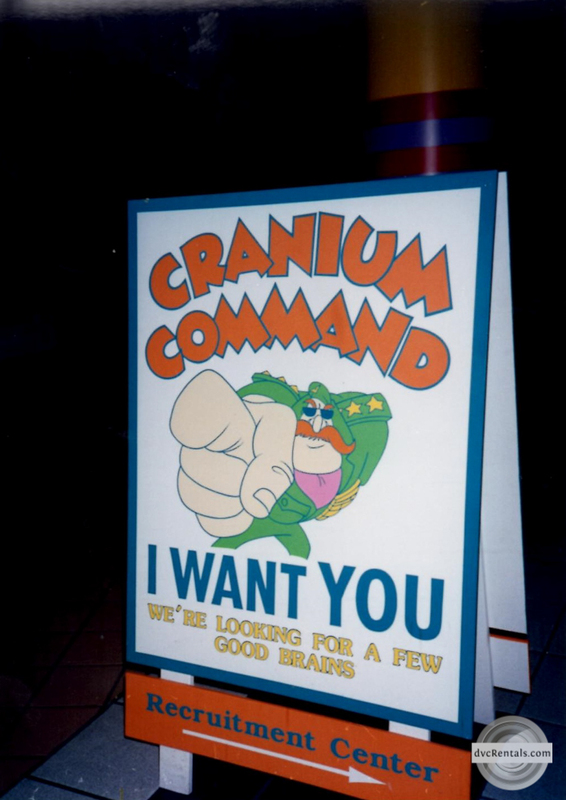 One of my favorites was Cranium Command in the now-defunct Wonders of Life Pavilion at Epcot. That building is now used as a Festival Center during the Flower and Garden Festival in spring and the Food and Wine Festival in autumn. The ride told the story of Buzzy, a young boy who had to “pilot” the brain of an adolescent male. Many celebrities appeared as the boys “organs”. For example George Wendt was the stomach, Charles Grodin was the logical half of the brain, Jon Lovitch was the emotional half, Dana Carvey and Kevin Nealon (doing their “pump you up” bit from Saturday Night Live) were the heart. It was very funny and creative and was a fun way to learn about the different parts of the brain and body. Figment is still around, but the current version is the third incarnation of the attraction. The first one was best according to most any article you read about it – and I completely agree. Figment played a much larger role, and there was no Eric Idle as Professor Niles Channing. Instead there was the Dreamfinder, a colorful and imaginative character (who also appeared as a live character outside the attraction, played by Billy Bart, until they changed the ride). 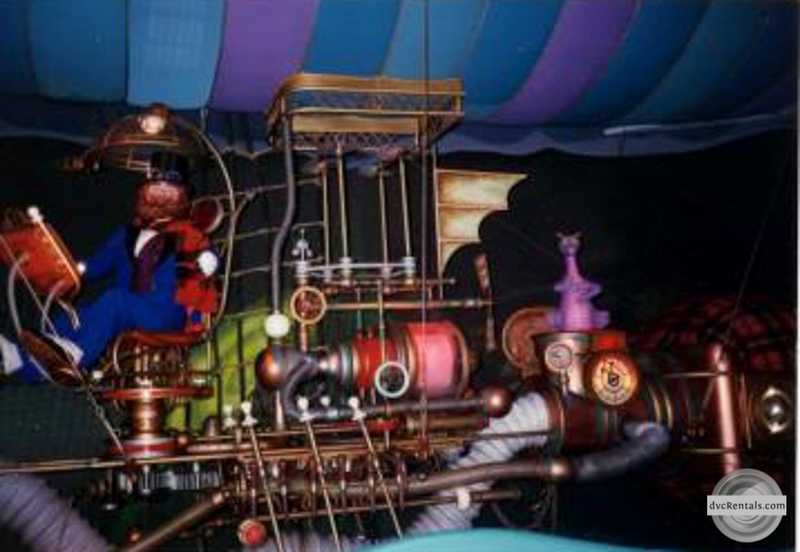 Dreamfinder was there to help Figment discover how to use his imagination. Figment imagines himself as, and we see him in various costumes as, a pirate, a superhero, a cowboy and a dancer, among others. There were more songs, including the beautiful “One Little Spark”, written by the Sherman Brothers. 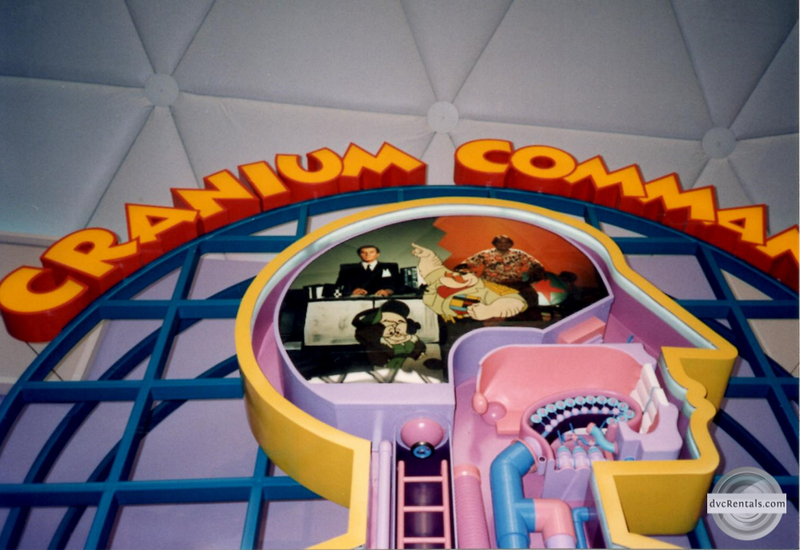 The attraction was beloved, but for some reason Disney decided to change it in 1999. The script and scenes were completely different and far less creative. Gone was the Dreamfinder and Figment was rarely seen. There was such an uproar that the ride was changed again in 2002 to add more Figment scenes, but alas the Dreamfinder was gone for good, replaced by Dr. Channing. In celebration of the new millennium, Spaceship Earth in Epcot had a wand added above it, along with the number 2000. Both glowed brightly and colorfully at night. This was met with mixed reviews. Eventually the 2000 was taken down and only the wand remained. 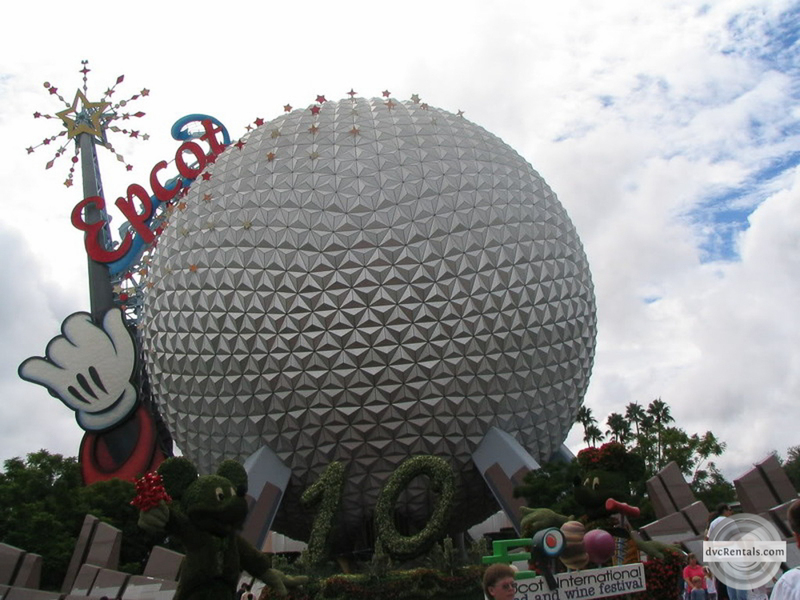 This was removed in 2007 to celebrate Epcot’s 25th anniversary, and Spaceship Earth returned to its original state. I know I said this blog was for things gone at least ten years, but this one exception is close enough! Character meet and greets are much more organized now, but there was a time when it was a lot more laid back to meet characters. 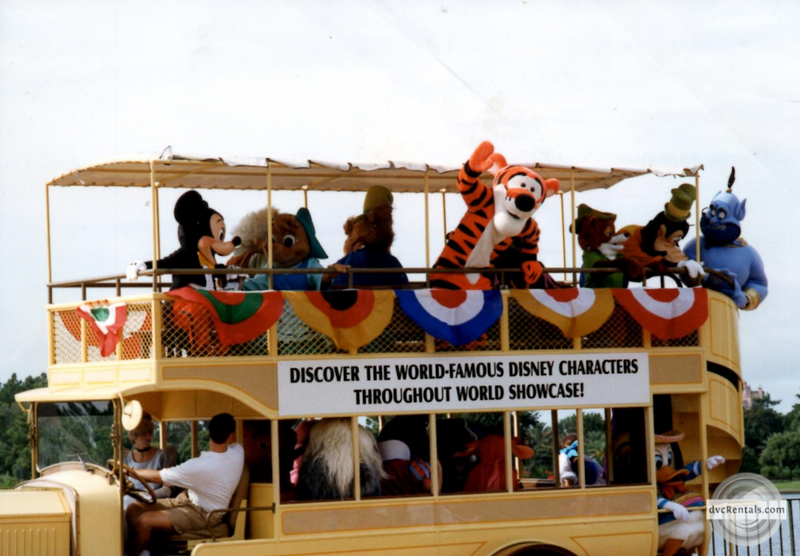 For example Epcot had a character bus that stopped at various locations around World Showcase. It was filled with characters, usually at least ten, often more. The characters would disembark and meet with guests, sign autographs, etc., before getting back on the bus to go to the next stop. It felt very spontaneous compared to the meet and greets of today. They stopped this in 2005, but the photos I took that are in this blog are from 1993. 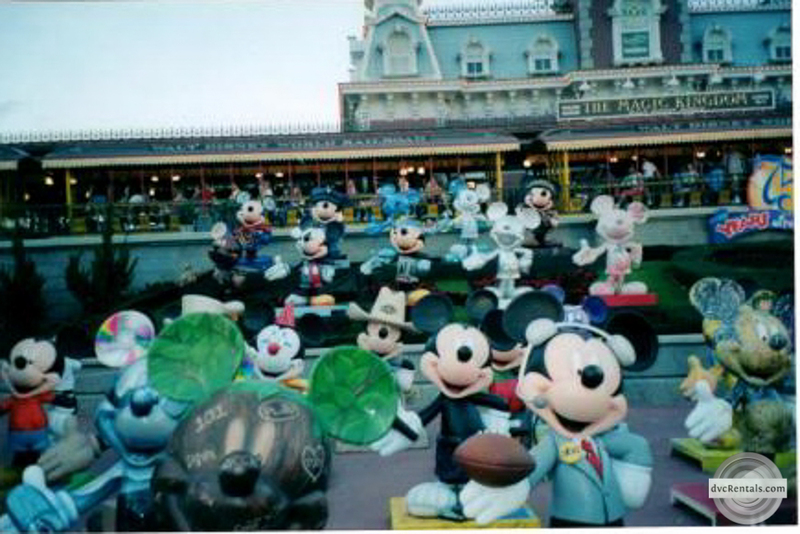 From November 18, 2003 (Mickey’s 75th birthday) until April 2004 there was a special exhibit in front of the Magic Kingdom. 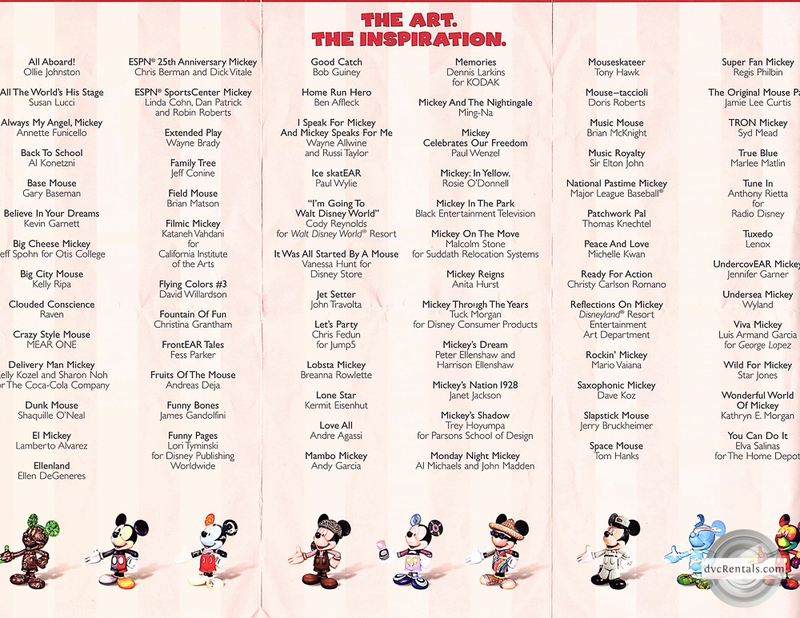 The exhibit consisted of the same exact statue of Mickey decorated in various ways by different celebrities and organizations. Many of them were very original and clever, and seeing them all was a sight to behold. 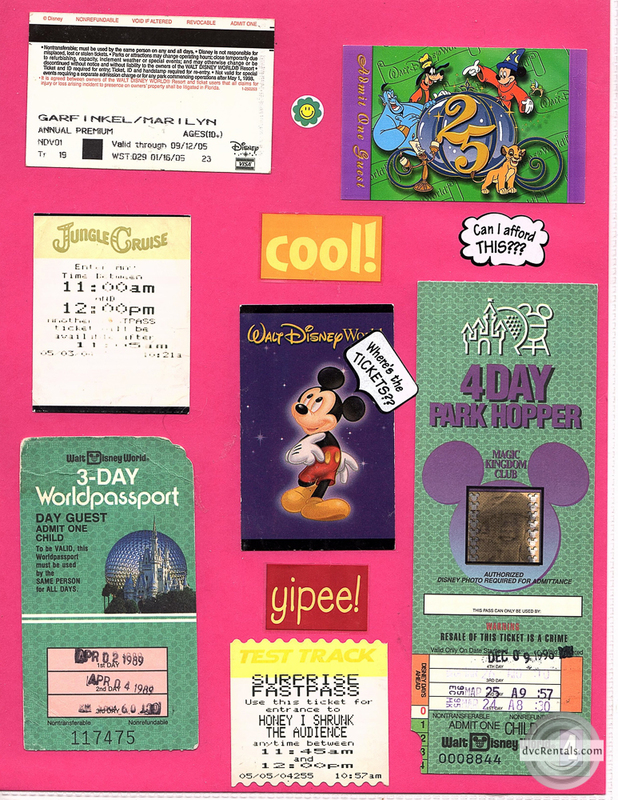 Once they left the Magic Kingdom they toured many cities in the country, ending at Disneyland in California. I happened to see some of them again at the big Disney store in New York City a number of years later. They looked a little worn but otherwise it was very cool to see them again after all that time had passed. Parades have certainly changed through the years. 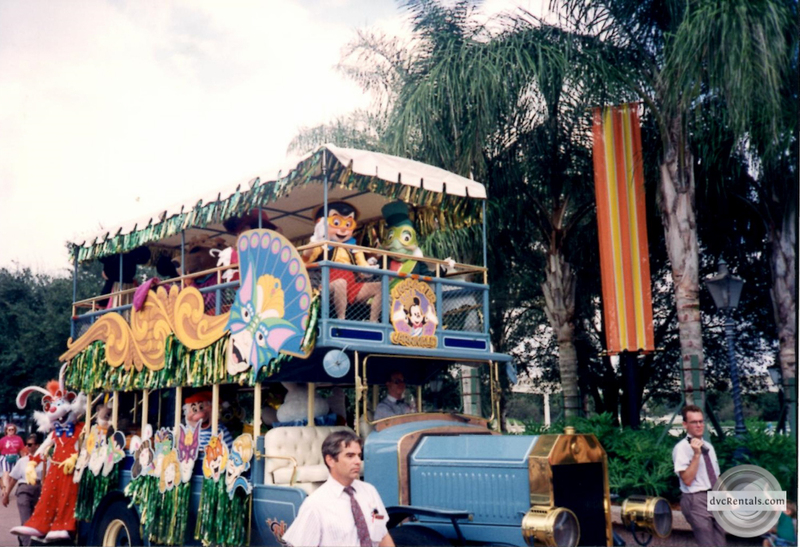 I’ve included pictures of the Magic Kingdom parade from 1993 and 2005, as well as the Tapestry of Nations parade from Epcot that I took in the year 2000. 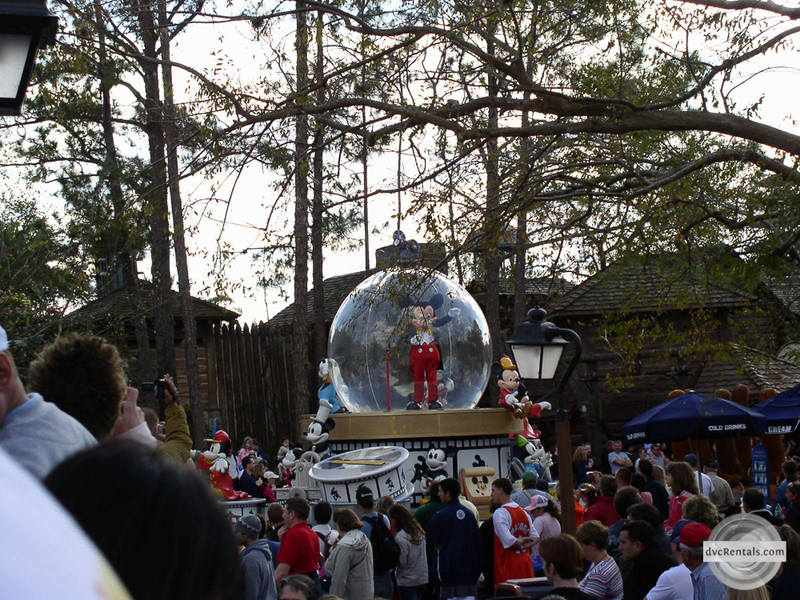 This parade is missed by many; it started in 1999 and was removed in 2001. 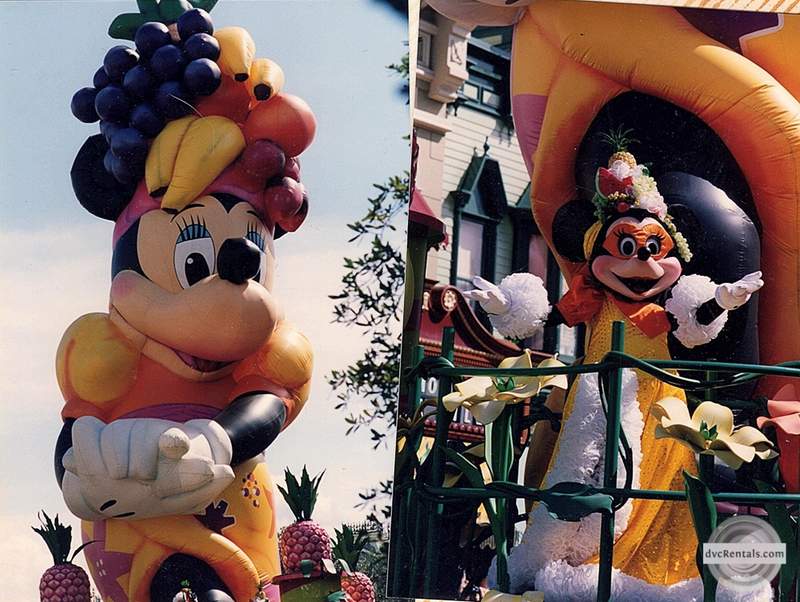 The 1993 parade in the Magic Kingdom was the last year Roger Rabbit would appear in a parade at Walt Disney World. 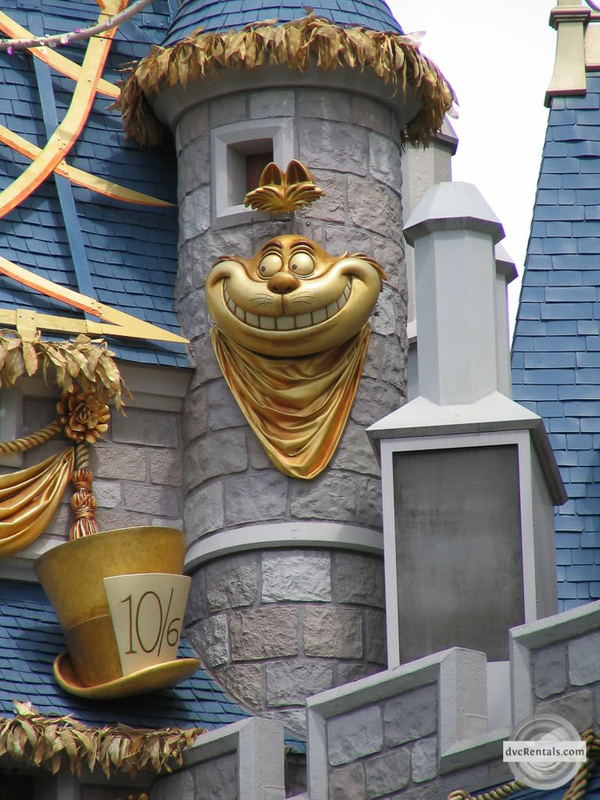 For reasons unknown to me, Roger is almost completely gone from the park now. There used to be a whole section devoted to the rabbit near what was (it recently closed) the Honey I Shrunk the Audience playground at Hollywood Studios. 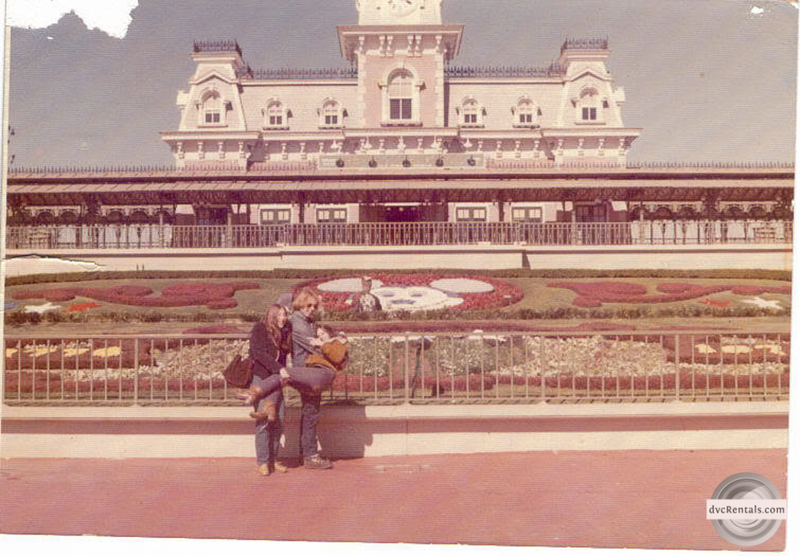 Just for the fun of it here is a picture of the front of the Magic Kingdom from my first visit in 1976. Although it basically looks the same, the Mickey head made of flowers and the surrounding area changes color and design frequently. Changes are made according to seasons and to any special events (i.e. Mickey’s Not-So-Scary Halloween Party and Mickey’s Very Merry Christmas Party). I hope you enjoyed this trip back in time! 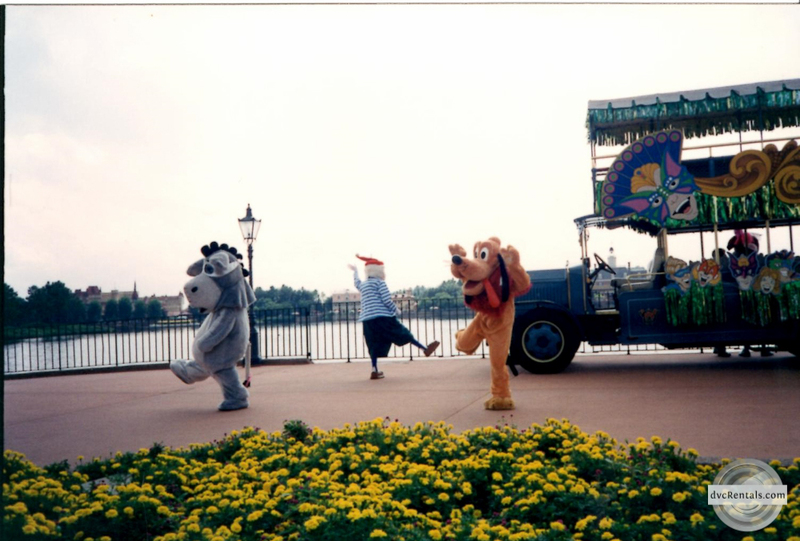 I really enjoy looking through old photos of Walt Disney World. So much has changed over the years. I have only touched on a small percentage in this blog. 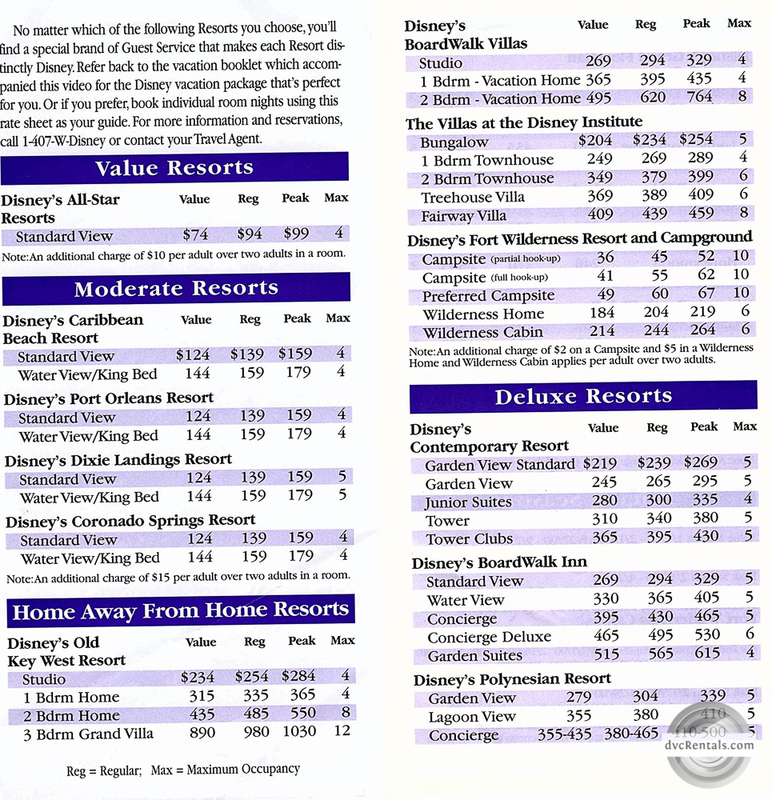 If you’re interested in learning more there are a number of websites that are devoted to retired attractions/events at Walt Disney World that can be found through Google. 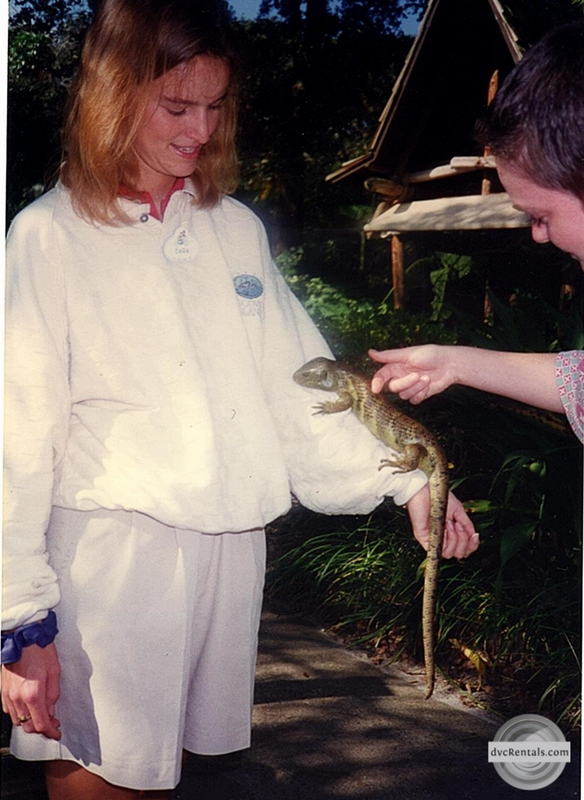 12 thoughts on "Walt Disney World a Decade Ago"
Lauren Dixon-I think our first trip together was about 10 years ago! That was really fun to see. There definitely are things I miss that aren’t there anymore. There are some small things too like the napkins all had Mickey on them and I actually liked the fireworks better at Epcot back in like 1997 it was neat. But I do love everything about Disney whether things come and go. I remember that Brides were cancelling their wedding plans when they turned the castle in to a pink cake. This is great, so many memories. 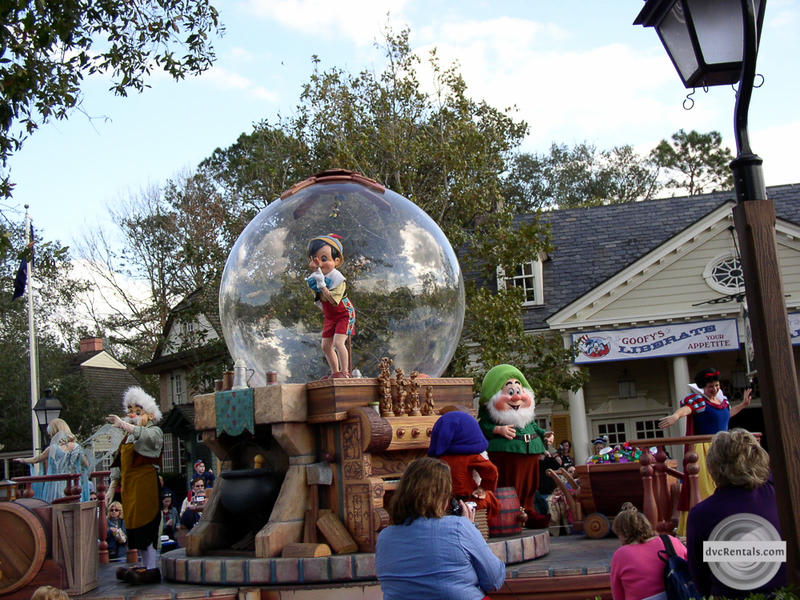 Discovery Island, the snow globe parade, the giant balloons parade, really enjoyed this article. The reason I did my honeymoon in Disney World in 2012 was that I hadn’t been there since 1993 & wanted to see all the changes. Luckily, I have been back a couple times since so not as many dramatic changes. Waiting for 2018 to go to see Avatar land complete & hopefully a slower Frozen area.